Safe and reliable products. Just add few drops of aroma oil and water, You can create aromatherapy to purify surrounding air throughout the house. Add more moisture can prevent dry and cracked skin. adopt to polypropylene material design makes the diffuser look simple and graceful. Ease to carry or use it as a decorative of the room is an unique scenery. You don't need to worry about too wet at night.You can choose the mist time according to your requirements. There are half hour, 2 hours, 4 hours or continuous. Soft 7-color LED light can change color automatically. You can choose your favorite color or you can cycle through the color. Use it as a night light can add romantic atmosphere. Whisper Quiet: Use the ultrasonic technology to ensure quiet when you sleep. Adding several drops of essential oils. Fill the space with your favorite fragrance, relieve your strees and sleep better. 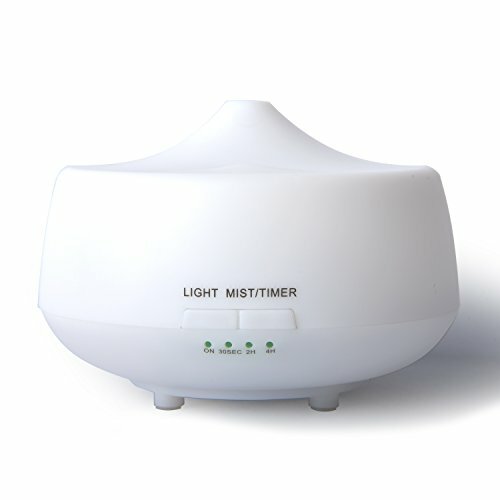 Air purification: This is a humidifier to keep the air in your room humidity and preventing colds/flu and congestion. Provide extra moisture for your skin and prevent dry or cracked. Timer options: You can easily press the Mist button to choose a timer setting, half hour, 2 hours, 4 hours or continous. Select a suitable mode and create a comfortable environment. Color options: With 7 different color lamp for you choice. Or you can choose one fixed color. And the aroma diffuser can be turned off entirely. Enjoying this perfect colorful aroma diffuser can bring you different moods. Apply to: Safe and easy to use, just fill with water and add a few drops of your favorite essential oil. Great for home, yoga, bedroom, baby room, office, study, kitchen, and aroma spa etc. If you have any questions about this product by LUJII, contact us by completing and submitting the form below. If you are looking for a specif part number, please include it with your message.